We are offering you a great pin from closed HRC Kuwait! It is in good condition and will be a great addition to any HRC collection! - You may be sure that your item will be carefully packed as we use cardboard, tape, bubble wrapping and other things to protect your package. 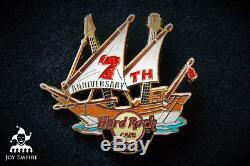 The item "Hard Rock Cafe Kuwait 7th Anniversary Sailing Ship Pin 2011" is in sale since Friday, April 13, 2018.